"Breathe in the light and say goodbye." Well, this is the moment some of you have been waiting for. Back Lot Records has released a streaming version of M83's new soundtrack for Oblivion, including all 17 tracks (on the regular release) available to listen to in full right now. We originally featured the first "StarWaves" track, and felt it was worthwhile to mention this full release. Though I don't know how to feel about these early streaming releases, because at this point I'd rather wait to hear the rest of the score in the movie first, then listen to the rest of the soundtrack. But that's just me. If you're anxious to start listening to these songs right away without the visuals, this is your opportunity. From what I've listened to, everything sounds amazing. 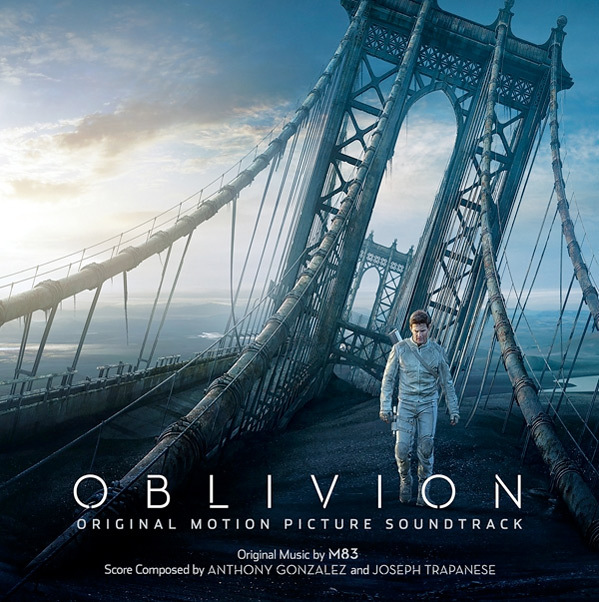 As you can see on the album cover, the Oblivion score is credited to both Anthony Gonzalez and Joseph Trapanese, playing as M83. While it is available for streaming now, the M83 soundtrack for Oblivion in full will be released on April 9th from Back Lot Records. They also have a Deluxe Edition with 30 tracks. Thanks, but got the CD preordered already! Not sure if I want to hear it before or after I see the film... I think after. Joseph Kosinski if not a fantastic film maker has great choice in the soundtrack of his films, although a lot of people didn't think Tron Legacy was amazing, I loved it for the atmosphere of the film and the score behind it just made it that more amazing. From listening to Oblivion's score I'm already so excited for the film and to experience the world he created. I get chills every time I hear StarWaves. This whole thing is amazing. Just amazing! Preordered mine already as well. Really like it. Better than a lot of recent soundtracks. So it's 30 tracks in iTunes, I don't think this counts as "all". Still nice to preview, though. No, the full album is 17 tracks - this is all of them. The "deluxe edition" is 30 tracks. This is the full album, the deluxe edition is different with bonus songs. Track 2 - 'Waking Up' sounds a LOT like 'Rise' from TDKR soundtrack. Certainly a similarity in whats trending for film soundtracks in the past five years. I enjoy working to music like this. 16 Undimmed By Time Unbound By Death was beautiful.